Home > Technology > A remix for voice? Under pressure to boost warehouse productivity and keep up with the relentless demands of e-commerce fulfillment, many distribution centers are installing voice-directed picking systems for warehouse staff. Compared with manual methods like clipboards and checklists, the technology offers a quick return on that investment by supporting accurate picking and efficient training, proponents say. Inspired by these results, many users are finding creative new environments for voice technology, expanding it to applications beyond basic order picking and using consumer electronics like smartphones instead of proprietary computers to host the voice software. As with any new technology, it's virtually guaranteed that companies will continue seeking new ways to apply these systems to benefit their operations. As users push the boundaries of voice into new territory, their effort is already paying off in some corners of the supply chain universe. The spread of voice-directed warehouse operations has been driven by a number of factors. Changing shopping patterns have lit a fire under warehouses to find faster, more accurate ways to fulfill online orders from individual consumers. "E-commerce is huge in creating the demand we see, specifically in the picking and packing area," said Keith Phillips, president and CEO of voice solutions developer Voxware Inc.
Testament to voice technology's growing acceptance is an upswell in praise from analysts. A Gartner report titled "Hype Cycle for Supply Chain Execution Technologies, 2015" declared that voice-directed picking for warehouse management had progressed well beyond the experimental stage and had reached "productive maturity." That means that supply chain and IT leaders looking to transform their logistics operations see warehouse voice devices as solid profit drivers, with a more reliable payoff than emerging technologies such as robotics, big data, the Internet of Things, and smart machines, the report said. At the same time, vendors have continued to refine voice technology by improving software stability, offering a wider configuration of devices, and cutting prices. Taken together, these developments have opened the market to small and mid-range DCs as well as the mega-warehouses, and helped drive a spike in demand for voice-directed products over the last 18 months, Phillips said. Consumer devices such as the Samsung Galaxy S smartphone and watch shown here are increasingly used in distribution centers. They're usually less expensive than proprietary handhelds. As warehouses roll out more voice-directed systems, many of their younger employees see parallels between this new technology and the voice-controlled videogames, GPS units, and smartphones they use at home. Inevitably, the question arises: Why not run these voice-directed picking applications on consumer hardware such as smartphones? After all, in addition to their familiar shape and interface, the consumer devices marketed by companies like Samsung, LG Electronics, and Apple are generally less expensive than the proprietary handheld computers deployed in warehouse picking and scanning operations. And sure enough, a flurry of voice providers have answered the call. A number of suppliers, including Lucas Systems Inc., TopVox Corp., and Voxware, now offer voice picking applications on consumer devices. The transition from proprietary hardware to consumer devices promises to be technologically simple, since many providers of voice applications are already running their software on Google's Android operating system, the same OS that drives many consumer hardware platforms. For example, Lucas applications are in wide use today on Android OS-based devices such as smartphones and tablets, said Ron Kubera, the company's executive vice president and chief marketing officer. Lucas also supports Android smart watches and glasses. Using the familiar smartphone platform means workers can get up to speed quickly without requiring extra training. "The work force is familiar with the smartphone form factor; their supervisors can't get [the phones] away from them," Kubera said. Attracted by the convenience and cost of smartphones, more warehouse operations are incorporating these tools into their picking processes. Despite this new array of offerings, with their promise of low hardware costs and high comfort levels for users, there is debate in the voice community about the benefits of hosting warehouse software applications on consumer hardware. The battle lines have formed along predictable sides, with software vendors extolling new consumer devices and hardware vendors supporting the standard proprietary platforms. Opponents' concerns about using consumer smartphones in the warehouse environment include worries about their durability, how to manage multiple cables and accessories, and security problems with locking out distracting apps like texting, games, and social media. Ring scanners like this one from Honeywell perform better and are more comfortable and durable than previous versions. Watching from the sidelines is a third camp that includes vendors who remain agnostic about the hardware platforms that support these applications. Michael Womeldorph, senior product manager for voice at Intelligrated Software, echoes the commonly heard concerns about consumer hardware's ruggedness, security, and battery life. Most consumer devices aren't designed to stand up to the rugged warehouse environment or run for lengthy work shifts, he says. It should be noted that vendors of systems that run on smartphones have responded to those concerns by encasing their devices in tough, military-spec protective covers or attaching extra power packs to extend battery life. Customers are also inquiring about building voice applications on consumer devices like smart watches, although few users have actually deployed them, Womeldorph said. His company is willing to meet those demands, he said. "We are device agnostic; we will go where our customers want to go," Womeldorph said. "Many times, we are leveraging whatever platform they may already be using, like mobile computers from Zebra or Honeywell, or voice-only devices from Spectralink or Cisco." Typically, a systems integrator will work with those components, adding a ring scanner or wireless Bluetooth headset for further functionality. "We don't want to lock customers into a certain platform; what we're looking for is simply a telephony platform, whether that's on a phone or a computer," Womeldorph said. Thanks to the wide array of platform options and to its improved reliability, voice technology is spreading far beyond its original applications in order picking. 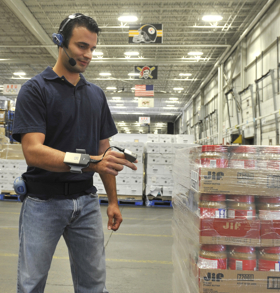 Industry analysts say users are now applying voice technology to a broad range of warehouse tasks. "The benefits of voice apply to all the workflows within the DC," Lucas's Kubera said. "Picking is the low-hanging fruit, but we're also seeing it used for consolidation, loading, receiving, replenishment, and cycle counting." "It started with picking, but now voice is also used for replenishment, inventory, and packaging," adds Chris Heslop, global director for workflow solutions at Honeywell Sensing & Productivity Solutions. "In the classic application, the headset would just say 'Go to aisle 7, slot 4, pick 3.' Now, you find voice in other applications in the DC," like fleet maintenance and inspection. In addition to finding new applications in warehouse operations, voice-directed technology is also paying off through business analytics, Heslop said. A voice application can capture data from every interaction in the DC, send the data to a cloud-based server, and generate reports for managers. Supervisors can examine those numbers to identify the causes of unnecessary delays, track certain shifts or workers, and generate predictive analytics that forecast shortages and delays before they occur. As voice technology and consumer hardware continue to converge toward a potential shared future in supply chain applications, reluctant vendors could eventually drop their objections and come around to meet that demand. In the end, the old saying may still apply—the customer is always right. Editor's note: This is a revised version of a story that was posted on July 22, 2016. The story has been updated to provide a more accurate picture of market conditions. Feedback: What did you think of this article? We'd like to hear from you. DC VELOCITY is committed to accuracy and clarity in the delivery of important and useful logistics and supply chain news and information. If you find anything in DC VELOCITY you feel is inaccurate or warrants further explanation, please ?Subject=Feedback - : A remix for voice? ">contact Chief Editor David Maloney. All comments are eligible for publication in the letters section of DC VELOCITY magazine. Please include you name and the name of the company or organization your work for.